The term home-made has a reputation it doesn't really deserve. The inference is that it'll be better than shop-bought. (When applied to food at least - home made ejector seat anyone? Home made dentist's drill? Headache - try some of this paracetamol I've just whipped up?) Sadly this is not always the case. Home-made spans quite a range. We've all inwardly shrieked at the baking of proud but unskilled friends, while we snarfed down some collection of over cooked crumbs or deflated cake. Then again, there are those wonderful people who can summon magic things from the oven or barbecue. Theirs is a home that has made good things. My neighbour Ken makes the BEST beef teriyaki. I can't better it. I've not even tried. I like that it's a bit of a thrill when he turns up in the few sweaty, summer weeks clutching his Tupperware tower of marination and expectation. BUT, as with Ken's teriyaki, the difference between a home-made and supermarket scotch egg is marked. For a start, as in the pictures, your yolk can be soft. There are few things nicer than a runny egg. I may have mentioned in other posts, my death row meal would be foie gras with brioche toast and onion marmalade (or pan fried muscat grapes if the prison canteen was on good form) but dippy eggs and chips comes a very close second. Supermarket offerings tend to be overcooked with a dry, friable yolk and dull, rubbery white within a damp flannel of tasteless, under seasoned meat. The food equivalent of a weekend in Margate! (and yes, I've been. Although the Lifeboat pub is wonderful, and I did have the best B&B breakfast ever there. We were there to try the acclaimed Indian cooking of the Ambrette restaurant. They didn't disappoint.) Home made scotch eggs taste of egg and seasoned pork and not of that fried coating of golden grit that you know has never seen bread. Here I am dissing the supermarket egg but you just know I happily, hypocritically, scoff them down. The home made egg is also properly crisp and crunchy; the shell cracking to reveal delicious, lubricious pork... all yielding to a soft eggy interior. I adore them. There is a massive thrill (I don't have many thrills in my life. Can you tell?) to cutting open an egg to find a soft yolk. There's been a lot of interest in these reinvented pub snacks recently, appearing even on the menu of the Michelin starred restaurants. They have nothing to do with Scotland so hence no capital 's'; the scotch, as with butterscotch, meaning something only as vague as 'cooked'. Related to scorched maybe? Maybe not? Either way, Fortum & Masons are adamant that they invented the meaty morsel in 1738 (I promised myself I wouldn't use morsel but here we are, only three pars in and I've let everyone down.) F&M seem to have all the evidence to support their claim too. I'd like to say they're not a faff but they are of course. However, if you make one you can make twelve. They will all be eaten. Fast. Boil six eggs for five minutes and then put them in ice water to stop the yolk overcooking. Leave in the water for twenty minutes to firm up. Meanwhile, mix 750g sausage meat with 50g French mustard (or a blend of French and English if you want some heat), 10g of sea salt, black pepper and a handful of finely chopped mixed fresh herbs. I do mean a handful too. Chives for sure. Maybe parsley, oregano? Chervil if you're lucky enough to find it. Divide your meaty mix into six piles and roll between two sheets of clingfilm to about 1cm thickness. Remove the top layer of cling film. Carefully shell the eggs. This isn't that tricky. Just bear in mind they are only part cooked so peel rather than press. Dry the eggs with kitchen roll. This makes them much easier to handle and coat. Put the egg in the middle of the meat patty and roll it up and around. This is where the cling film helps. Again, this isn't as fiddly as it sounds. Dip the eggs in seasoned flour, then beaten egg wash and finally breadcrumbs. Massive faff factor warning. This is one of those three bowl conveyor systems where It helps to have a son to help you (Thanks Fabe) to avoid massive, claggy finger syndrome. This is what you end up with. 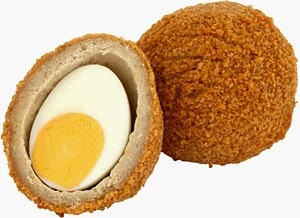 An unborn scotch egg. Almost looks cute doesn't it? Fluffy. Fry the eggs in deep oil at 180°C. It does need to be the right temp so use a sugar thermometer or drop in a test piece of bread - it should take a minute to turn golden brown. Deep fry the eggs for 6-7 minutes. You'll probably have to do this in batches to avoid lowering the oil temperature too much. Was it worth the faff? My family thought so. In the end, home-made means you have to make it at home. Oh, unless you have a gastropub close by because they always sell this kind of thing. But a gastropub in Palmers Green? I wish. No really, I do wish.